India is a land of many cultures and traditions. Its capital is New Delhi. On traveling from north to south and east to west, you will be amazed to see a plethora of different landscapes and people speaking different languages. As you move from one city to another, you will see a beautiful culmination of the old and new. India is perhaps the only country in the world that still portrays an awe-inspiring mix of the rural and the urban. Though many people still hold a lot of misconceptions about this beautiful country, the people of India are and will continue to have a lasting impression on the world at large. New Delhi is situated in the North of the country. Known as the National Capital Territory, Delhi is a city that still holds traces of India’s rich history, culture and tradition. The city is home to a number of monuments that are of great historical significance. 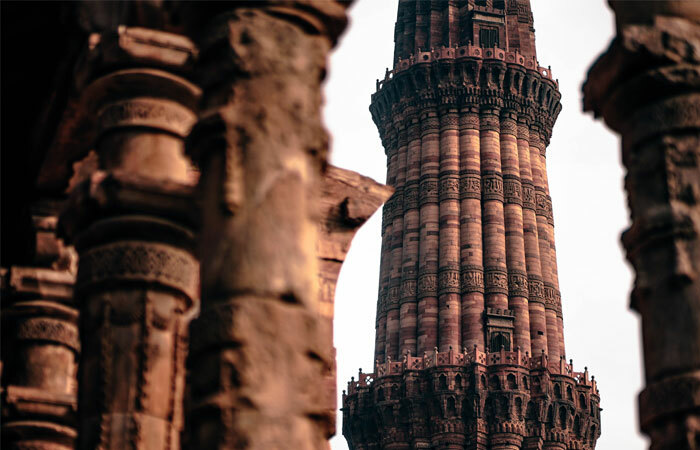 Built by Qutubuddin Aibak in 1193 AD, the Qutub Minar is an awe-inspiring 5 storey Minar in New Delhi. A visit to this World Heritage Monument is an absolute must to appreciate this architectural beauty of the Muslim dynasty in India. Most schools organize trips for their students – a most enjoyable and memorable experience for students who thoroughly enjoy looking up at this tall wonder. The Red Fort is a beautiful Mughal citadel in Red Sandstone that can be seen as one approaches Old Delhi – the historical part of Delhi. This architectural masterpiece is home to the Diwan-e-Aam and the Diwan-e-Khas, the Rang Mahal and the Royal Baths. Make sure to take time out and witness the Sound and Light Show that takes place in the evenings after dark. People can pay their respects to Mahatma Gandhi, the Father of the Nation at Raj Ghat which is a memorial on the banks of the Yamuna River. If you happen to visit Connaught Place in Delhi, you must take time out to walk across the Jantar Mantar which is an unusual park consisting of interesting red sandstone structures, built in 1724 as an astronomical observatory for Raja Jai Singh. The India Gate is definitely one of the most popular monuments in New Delhi. Situated on the Raj Path, India Gate was earlier known as All India War Memorial monument and was built by Edwin Lutyens to commemorate those Indian soldiers who died in the Afghan Wars and World War I. Besides the beautiful architecture, you can also admire and appreciate the fine detailing with which the names of the soldiers who died in these wars are inscribed on the walls. The Amar Jawan Jyoti is a flame that burns to mark the immortal soldier. This is a beautiful Mughal Garden Tomb made of sandstone – a grand mausoleum built by his Queen and counted as a World Heritage Monument. International Society for Krishna Consciousness is situated in East of Kailash on a hill top. This famous temple is made of red stone and is a must-visit for all of Lord Krishna’s devotees. The daily chants, Bhajans and Aarti are not to be missed. The atmosphere inside the temple is one of calmness and serenity. There is a Temple shop and restaurant as well. Also known as one of Asia’s largest Mosques, the Jama Masjid was built by Emperor Shah Jahan in 1656. Built close to the Red Fort, the Jama Masjid is visited by devout Muslims in large numbers. The beautiful architecture of the Jama Masjid is bound to fascinate you. This is one of the most prominent and frequently visited Sikh gurdwara in New Delhi. Its tall golden dome will catch your eye from afar. The Gurudwara’s Langar is open to all persons irrespective of their caste or religion. A visit to this modern architectural marvel is a must while you are in New Delhi. Shaped in the form of a half-open lotus flower, the Bahai Temple is made of white marble with beautiful greenery all around. People visit the Lotus temple to gain a sense of spiritual upliftment and peace. Here you will not find any idols or pictures and the temple is open to people of all castes and religions. This building in white marble commemorates the martydom of the Sikh Religious leader Guru Tegh Bahadur who was beheaded by a Mughal Emperor and this Gurudwara is built on the site where the Guru was martyred. Also known as the Lakshmi Narain Mandir, The Birla Mandir was built by the Birla family of industrialists. The Mandir has beautiful architecture and is frequently visited by many devotees and tourists. St. Peter’s Cathedral is situated in New Delhi and is considered to be the spiritual center of Syrian Orthodox Christians. The Akshardham or Swaminarayan Akshardham complex was built in 2005 by more than 8,000 volunteers from across the world. Made from carved sandstone and marble, this temple stands out for its stunning architecture and as a spiritual and cultural campus. It is one of the most well-known museums in Delhi which is built on Janpath. On display are a large number of galleries which are home to numerous artifacts that showcase India’s rich cultural heritage. Located in Jaipur House, India Gate, the NGMA houses paintings of various Indian artists. If you enjoy watching locomotives, you must visit the Rail Museum that displays the development of Indian Railways. Shopping always tops the list of must-dos for travellers and visitors to New Delhi, India. Delhi offers a mix of sophisticated multi storied malls as well as crowded street markets where you can pick out some of the best deals possible. Hauz Khas Village – boutiques, restaurants, and shopping galleries. Foodies love Delhi as there are so many mouth watering choices for everyone. Right from multi-cuisine 5 star restaurants to desi dhabas serving some of the irresistible delicacies, food choices are aplenty in New Delhi. Delhi experiences extreme temperatures. Summers are usually very hot and humid while winters are usually quite cold. Best time to visit Delhi is during Oct – Nov and March – April. Whether you are visiting New Delhi for the first time or just want to spend a complete day exploring the myriad shades of Delhi – you will definitely not be disappointed what with its several sight seeing options – a mix of new and old!